Our journey to having twins began on Christmas Day in 2015. I snuck out of bed early to take a pregnancy test, hopeful for a positive result so that I could give hubby (Adam) an extra special Christmas present. My eyes lit up when I saw the 2 lines and I quickly wrapped it up and put it under the family’s Christmas tree (it is tradition for the 4 daughters, our partners and kids to all stay over at my parents on Christmas Eve). When it came to opening his gift, Adam was completely surprised and ecstatic! It made for an extra special Christmas Day, sharing our news with our immediate families. I went off to the doctors in the first week of January and booked a dating scan for the 14th, when I would be approximately 7 weeks pregnant. After experiencing the heartbreak of a miscarriage only 4 months earlier, we decided that Adam and our son (who was 18mo at the time) would come along for support. I drank the required amount of water and was both nervous and uncomfortable (the pain of a full bladder!) on the journey to the radiologist. When my name was called, the 3 of us went into the room and my heart raced. I laid down on the table, hoping only to hear a strong heartbeat, as the radiographer started ultra-sounding. She was concentrating hard but wasn’t saying much. Eventually she asked me if I would be comfortable having an internal, and based on my past experience, I immediately questioned (in a shaky voice) if there was something wrong, while Adam squeezed my hand. To our complete shock, she replied “things look good, it just looks like there’s 2 in there”. Adam and I looked at each other in disbelief. All at once we were picking our jaws up off the floor, bursting out laughing, and saying “Oh sh*t!”, “Oh my god! Oh my god!” I raced off to empty my bladder for the additional ultrasound and then it was confirmed, we were having fraternal twins!! We finished up and slowly walked out to the car. We were absolutely dumbfounded. Twins didn’t run in the family, and it didn’t even cross our minds that this could be a possibility. I remember saying, “we went into the scan hoping for a healthy baby (embryo) with a strong heartbeat, and here we are now with 2! !” We sat in the car and started making phone calls, with the first to my Mum of course! She had only just asked that morning about organising time off work around when we were due, so we jokingly said that she might need to take more time off than planned, and she guessed it, twins! She was very excited! I remember speaking with my Dad who was in just as much shock as we were and he just laughed. My in-laws were also very surprised and absolutely thrilled. We had some fun with our siblings by asking them strange questions and sending them cryptic photos (2 eggs, 2 baby hats, some scrabble letters..) until they decoded our messages (it didn’t take long!) and joined us in disbelief. We told a few close friends who were equally dumbfounded. Everyone had their own concerns and questions, ‘How are you going to sleep them? You’ll need 2 cots.’ ‘How are you going to fit 3 car seats in your car?’ ‘You’ll need a bigger pram!’ We were in shock, so we did what we did best (pre-kids) and we went out for dinner to celebrate. We needed time to process things ourselves, so we decided to wait until our follow up scan a week later before we told any other family. Over the weeks that followed we were a bundle of mixed emotions. Every time we said the word “twins” we paused and laughed. I tried very hard to stay focused on all the positives and the excitement that we were feeling. I kept wanting to switch to task mode and to start getting things organised (because there was so much to do!!) but I also knew I didn’t want to get ahead of myself and I needed to stay relaxed. 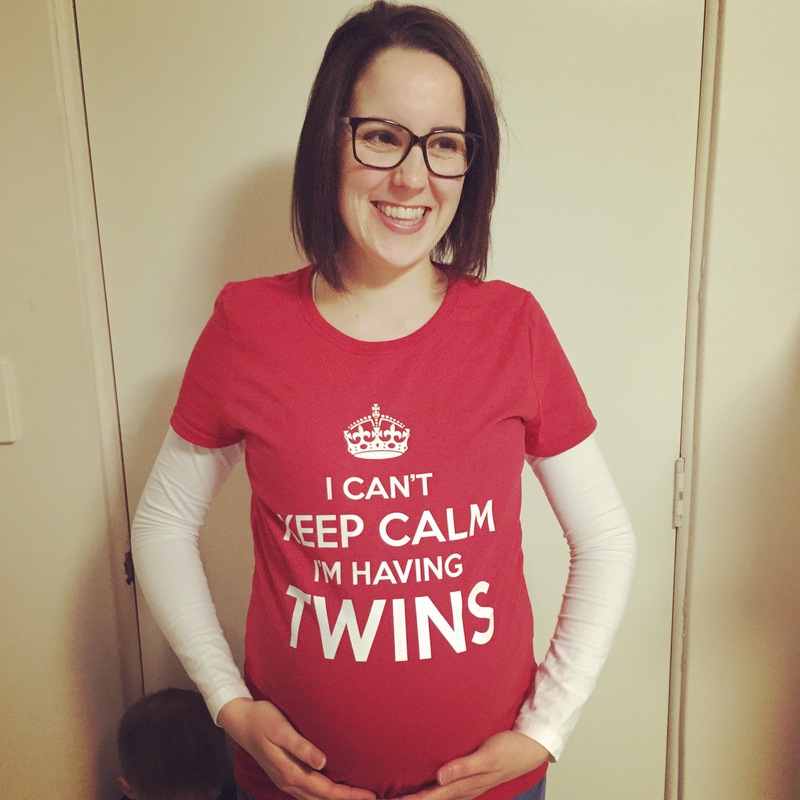 Well, as relaxed as someone can be when they’re expecting twins… and have an 18 month old. There were so many thoughts going through my head, some positive and some not so positive. In moments of fear I would catch myself thinking, ‘why me?’, and then I’d feel guilty for feeling like that after our recent miscarriage and when others were struggling around us. At other times I’d be over the moon at how blessed we were. I’d be amazed that we were having twins and that our little family wouldn’t be so little anymore, and only in a matter of months! I would go crazy thinking about how we were going to cope and all the work that would be involved and the help we’d need, having to give myself a little pep talk about staying positive and putting out good vibes. My heart would ache at the thought of not having any time for my little boy when the twins arrived, but explode with thoughts of him being a big brother to 2 siblings and how excited he’d be. I’d go to sleep wishing only to have 2 happy and healthy babies and that I could keep growing them inside me for as long as possible. I was both so excited but so nervous at the thought of how much our lives were about to change, it was an emotional rollercoaster. My advice to anyone expecting twins would be to enjoy your pregnancy as much as possible and to celebrate the miracle of growing 2 babies at once. Don’t let anyone make you feel guilty for being blessed twice and don’t let anyone dull your excitement. Try to stay calm and not let your thoughts and to-do lists overwhelm you. If you need to, then ask for help. You will eventually need to lean on others for support so you may as well get some practice in. When I was pregnant, I was told by someone with twins that it would be more than double the work, and whilst this is true, I wish they’d also told me it would be more than double the joy. Having twins has been our biggest challenge, but it has also been the best thing to happen to our family and we couldn’t be happier! Good luck on your journey! We wish you all the happiness and good health. Wow, that’s so exciting ❤ I wish you a healthy pregnancy.